Have you ever noticed weakness, numbness or tingling in your hands or wrist? 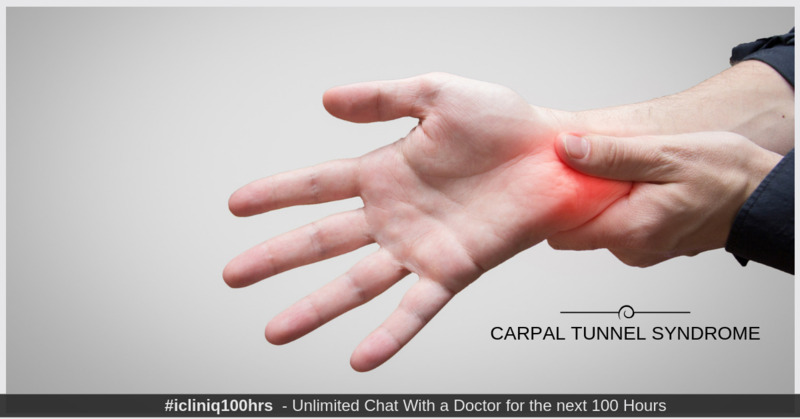 These symptoms may be due to a common condition called carpal tunnel syndrome. This is a nerve disorder affecting the strength and sensations in hand and wrist, caused by pressure on the median nerve, a nerve that supplies all the four fingers except the small one (pinky finger) and a few muscles at the thumb’s base, which in turn is due to narrowing of the tunnel. According to studies, women and elderly are more affected. Tingling, numbness, pain and burning sensation. Radiating shock like symptoms in the fingers. Weak and clumsy hands that makes it difficult to perform small day to day activities. Unable to hold things or often dropping them because of loss of proprioception or weakness. Inititally, it can be seen as numbness in wrist or hand mainly during the night due to their relaxed position. Some people find improvement in the symptom by shaking their hand or wrists. Familial or hereditary: Smaller or the ones due to differences in anatomy can follow in the family. Repititive movement of the hands: This may activate tendons present in the wrist and cause swelling that leads to pressure on the nerve. Pregnancy: Changes in the hormones may cause it. General health conditions like rheumatoid arthritis, diabetes, and imbalance of thyroid hormones have known to be associated with this condition. Tumor in the tunnel region that causes compression of the nerve. On visiting your doctor, the following diagnostic methods will be used along with certain tests to come to a conclusion. Tinel’s sign: Gently tap or apply pressure in the median nerve area along inside of the wrist and check for any numbness or tingling sensation. Extend or flex your wrist and look for any numbness. Checking the sensation in fingers with instruments and patient’s eye closed. Any weakness in muscles near the thumb. Electrophysiological tests: These help in identifying the severity of the nerve damage or compression along with diagnosing any other nerve compression or condition, if present. It helps to identify the nerve that is not conducting the signals and also the severity, thus helps in guiding the treatment as well..
As the name suggests, this measures the conduction of electricity in muscles and nerves. Ultrasound : This checks for nerve compression via imaging the soft and hard tissues. Hence, you may be advised to go for a wrist ultrasound. X-ray : A hand-wrist radiograph showing the arrangement bone will further help in diagnosis. Also, it can be used to rule out other conditions of bone. MRI : Magnetic resonance imaging can be used to visualize the soft tissue in a more detailed way. Wrist flexion test (Palen test) : In this, the patient is asked to rest elbows on the table and let the wrist fall freely for some time. Usually, the patients with this syndrome develop tingling or numbness in the fingers within 60 seconds. The more earlier the symptom, the more severe the condition. It is always better to visit your doctor in the initial stages of the symptom to get better treatment and outcome. The management can be either conservative or surgical. Conservative or non-surgical management. When the symptoms are in the initial stages, the following might help and avoid any surgery needed. Bracing or Splinting : Wearing them helps to relax the nerves and thus reduces the symptoms. They are preferred at night, but even during the morning, this can be worn. Non-steroidal anti-inflammatory drugs to reduce pain like Ibuprofen and Naproxen. Change in the activities that cause the pain or symptoms and giving rest to severe wrist movements. Exercises for nerve gliding: Certain exercises help in relieving the nerve from the tunnel and can be followed under doctor’s supervision and advice. Steroid injections: Injecting these in the carpal tunnel will help to relieve the symptoms for a temporary period. Surgical management. In case of severity of symptoms or muscle weakness or damage, a surgical method is followed to relieve the nerve and is called a carpal tunnel release. This can be done either endoscopically or through conventional method. After surgery, you will be asked to elevate your hand above heart level and move fingers to avoid or reduce swelling and stiffness. There can be minor symptoms like pain, swelling for a few months, and it may take time to get your pinch and grip actions back completely and effectively. You may also have to wear a brace or splint for quite some time (weeks). Though the symptoms may look initially not so bothersome, it is always advisable to consult your doctor to clear the doubts and get the required treatment, if any, as soon as possible. The availability of doctors online through some medical platforms have made the consultations with them easy, and thus, you can get guided professionally. Do you have a question on Tingling Sensation In Finger or Numbness? My phone makes my hand tingle. Please help. Why is there a feeling of discomfort and numbness in my left arm? Are there any tests available to check pelvic muscle weakness?